Blue Mango Lodge is an outstanding guest lodge in a secure location just eight minutes from O R Tambo international airport. The lodge is in an ideal location just a short hop from various shopping malls, good restaurants, bars and nightlife, as well as being near to casinos, golf courses, horse riding, and health spas and gymnasiums.Accommodation is offered in beautiful en-suite rooms, all of which have been furnished to the highest standard. 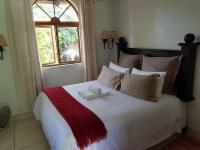 Room facilities include rich fabrics, DStv, Wi-Fi, tea/coffee-stations, complimentary toiletries and heaters. A FREE airport shuttle service is available on request.The lodge offers secure parking for up to 40 cars. Safari: We have a proffessional tourist guide to take you eg to Kruger Park at very affordable rates. Wedding Venues: The lodge is an ideal venue for weddings of up to 100 guests. Conference Venues: Our conferencing facilities can accommodate up to 60 delegates, and this is a quiet environment wth WIFI and room for many activities. We also offer tailored corporate packages. Family friendly: Families can have get togethers and have children's play ground as well. Lovely lawn areas for braai parties. Romantic: We are ble to turn the room around and make it the most memorable romantic day ever. Wonderful stay at the lodge. Stevie, Daisy and the staff very helpful. The set brings so much comfort. Food is so delicious.Highly recommend. Blue Mango Lodge is 30.2km from the centre of Johannesburg , the nearest airport 9.4km (Johannesburg International Airport).